The 12 gauge was invented all the way back in the 1870's and is one of the best firearms in the world. Whenever you need something for close range hunting, self defense, or sport shooting, the 12 gauge is everything you need. Proven through extensive use in the military and law enforcement, as well as years and years of civilian use, the 12 gauge has shown itself to be one of the best firearms in the world. 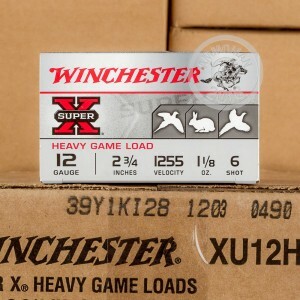 Winchester is the company you turn to when you want high quality ammunition. 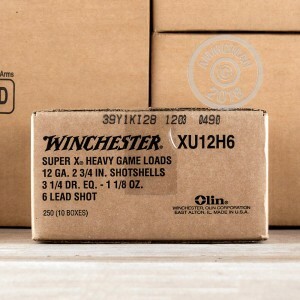 For over one hundred fifty years, Winchester has been supplying the entire country with their phenomenal ammunition. 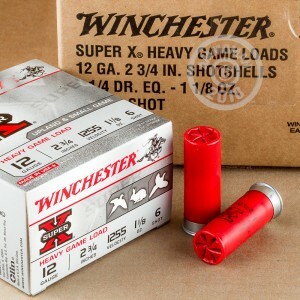 With these Super-X, heavy game load, 2 3/4", 1 1/8 ounce, #6 shot shells from the incredible Winchester, you have the power and lead that you need to bring down the delicious game you love.